The studio in the hills overlooks Laguna Beach, an art colony with its crescent-shaped cove and well-known summer arts festival. Christiana Lewis, an artist and humanitarian, leads me down a spiral staircase to her work area, where she has a blank canvas propped up on an easel. She wears torn blue jeans, a green tank top and two necklaces, one of which features the word, LOVE, the other the letter "E," which reminds her that she is striving to be an excellent person. Christiana, 44, identifies herself by her first name. This is not because she is a poseur, trying to emulate a Hollywood star like Liz, Angelina or Scarlett. It is because she has never really known her last name. She lived in foster homes and orphanages as a child until she was adopted at the age of four. She inverted the letter B for the number 8 when she was in third grade and was told that she was stupid by a cruel teacher. In fact, it turned out that she had dyslexia. Later, when she was in college at Cal State Long Beach, she was diagnosed with attention-deficit hyperactivity disorder, long before it became fashionable. She said that when someone would scrape a pencil, "my brain hears the pencil, and all memory is wiped out." She was allowed to study in a private room and to tape-record lectures, and she graduated with a degree in art, which had long been her refuge going back to her days in foster homes. I have written at length about the over-diagnosis and over-medication of children and the absurd notion, disclosed in a recent study, that nearly 20 percent of high school boys have ADHD. While many teenage boys and girls may have trouble concentrating, that is normal for adolescents, and it does not mean that they have a condition that rises to the level of a diagnosable disorder. I find it nothing short of reprehensible that doctors are prescribing psychotropic medication to so many of these kids, medication that they almost assuredly don't need and that can cause severe side effects and have tragic consequences, as depicted in Bronwen Hruska's recent novel, Accelerated. Christiana does not take psychoactive drugs. Instead, to tame her disorder, she focuses on her art, reads self-help books such as those by Louise Hay, and sips an occasional glass of red wine, as she does during our interview. Influenced by Gustav Klimt, Christiana often paints abstract images of female figures with sinuous curves and intertwined bodies. Rarely does her art include facial features. She leaves that to the imagination of the viewer. Due to their abstract nature and the suggestion of multiple perspectives, her paintings can conjure the work of Picasso. Christiana, who has toned arms befitting her other career as a fitness trainer, often creates a palimpsest out of her art work by including sections of headlines and articles from newspapers beneath the paint. She intends to include more explicit positive messaging, words of her own, beneath her paintings in the future. Those messages will promote the healing power of love, which is central to Christiana's philosophy of life. Not surprisingly, she co-founded a charitable organization called Lust for Life, in which she and Tracy Danielle, a singer and song writer with a pop/R&B sensibility, perform music, showcase art and hold poetry readings at various venues. Empowering women is one of their primary missions. As is helping children with disabilities. Not long ago, Christiana came back from what she says was a six-month humanitarian trip overseas to seven countries in Southeast Asia and South America, where she helped teach art to disabled children. Dedicated to her cause, she slept on a mattress on a floor in Laos and went to the bathroom in a hole in the ground. Christiana embraces her own disabilities and understandably characterizes them as abilities. She recently had one of her paintings displayed in the February/March issue of Ability magazine. She also recently signed a branding agreement with Ashworth, a marketing company based in Laguna Beach. Ashworth is designing her new website, www.lovechristiana.com. 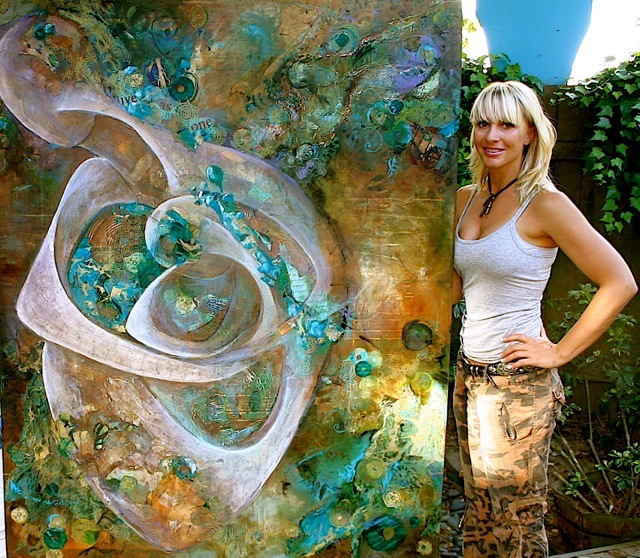 And she will be showing her work in July at the Laguna Gallery of Contemporary Art. With the fifth edition of the Diagnostic & Statistical Manual of Mental Disorders set to be published, there is the possibility that, as Christiana points out, "everyone can say they have something." But, as Christiana knows all too well, there is nothing trendy about mental illness. It is a scourge that, when most acute, can lead to suicidal thoughts. This is one of the reasons why she is so opposed to guns. I tell her that I am too. At a time when so many members of the public incorrectly assume that the mentally ill are dangerous, I wish that more people would get out into the community and learn about the beauty of a person like Christiana, who wants to heal others through her art.